Copper prices typically move in line with the health of the global economy as the base metal is used across a broad range of industries from construction to manufacturing. The key problem is China. Weak demand from China - which accounts for 40 per cent of world consumption of the red metal - means lower prices. The Chinese economy which has grown relentless over the last two decade is slowing down. China only managed to grow by 7.4% last year, a much lower growth not seen since 1990 when the country was hit by sanctions after the Tiananmen Square crackdown. This year growth is expected to dip further off the back of cooling investment, slow manufacturing and a sagging housing market. Demand for use of copper in financing deals has yet to pick up after a scandal over metals stored in warehouses as collateral in the port city of Qingdao left local banks tightening their lending criteria. The World Bank recently warned that a “disorderly slowdown” in China would force it to reduce its global growth forecasts further. The IMF has proceeded to warn African economies to be "vigilant". What does this all mean for Zambia? It all depends on how long the slump lasts and where the prices might finally end up. No one knows where the bottom is but it is likely to persist for the next 18 months. Lower prices are a real concern because our economy suffers from lack of diversification. Therefore it is not well positioned to withstand continuous weaknening of copper prices. There are three important ways lower copper prices hurts Zambia. 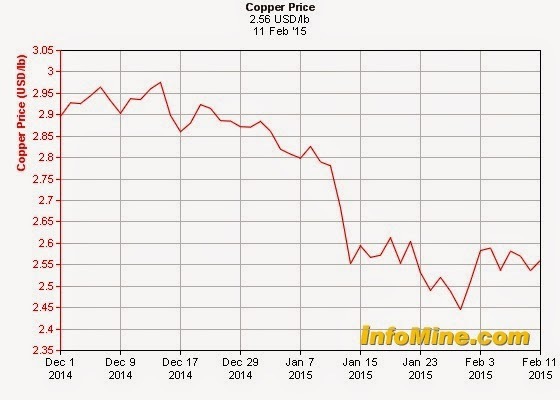 First, fall in copper prices lowers copper revenues which means further depreciation of the Kwacha. The Kwacha is currently falling, at the last check it stood at K6.7 per $1, having fallen by over 5% since the presidential by-election and over 18% during the last 12 months. We shall examine this risk separately in a future post. Secondly, we are likely to lower government revenues because reduction in copper revenues will mean lower than forecast mining taxation revenues. This is a problem in terms of fiscal policy because it yet again means government will continue borrowing more abroad and at home than suggested. That again may point further to credit down grade from credit agencies as the deficit worsens. And of course private sector credit may also further be crowded out from higher domestic borrowing, increasing private sector interest rates. Remember this time last year? Finally, unemployment pressures may increase. The reduction in copper prices are unlikely to lead to immediate job losses, but it will put further pressure on some mining houses facing high wage and taxation costs (and possibly higher energy costs if oil prices rebound in the future). This will continue to make new investments less likely until prices re-adjust to a much higher medium to long term equilibrium. These economic factors are within the context of larger politically sensitive debate on the new mining fiscal regime. The continuous fall in prices will increase pressure on Lungu to abandon the new mining tax. The 2015 budget proposed new resource mobilisation focusing on increasing mining taxation, after a deliberate decision to keep PAYE frozen before the 2016 elections. The current two-tier mining taxation system has now been replaced by a simplified tax structure. Mineral royalty taxes have been increased from 6% to 8% (underground mines) 6% to 20% (open pit mines) as a final tax. Capital allowance deductions and carrying forward of tax losses are no longer applicable. The changes came into force on 1 January 2015. The proposals mean total mining income contribution to government spending rise from 9.5% to 12.7%. However, these changes have met strong opposition from mining companies. They have threatened job losses. It is very likely that as the copper prices fall further these cries will get very loud indeed. The government for its part is broke and the budget would fall apart without the new fiscal regime. In short, it is increasingly now caught between a rock and a hard place. But it’s more complicated that because the long term position of copper prices (2017/18 and beyond) may actually be positive. Although there is likely to be continued weakness in copper prices in the next two years some of the weakness is likely to be offset by a decline in copper surplus. The gradual decline in copper prices has eroded the amount of cash flow and delayed projects, reducing surplus estimates. This may lead to a positive demand and supply imbalance. By 2017/18 the price of copper should rise back up to reach $US8000 by 2018 end as we enter a period of underinvestment in copper mines. What this means is that the Lungu administration must be careful not to take forward mining policies purely based on the negative copper scenario over next 18 months. Long term thinking is desperately needed. Indeed in the very long term structural demand for copper is positive. There are good reasons to believe that strong demand from China and other emerging economies in particular may continue for several decades, although the adoption of new technologies could see a lower degree of resource intensive output in these countries over time. Frankly "experts" would have made a big difference in the original disaster that was the privatisation of the mines. Unfortunately the people of Zambia missed the largest wealth creation opportunity in recent history through the amateur bungling of the privatisation of the mines - a return on equity to the likes of Vedanta that rivals Apple stock. The result has been significant wealth accumulation outside Zambia to the owners and shareholders of the companies that managed to get away with this robbery. Yet this is still not a source of real political debate in Zambia - the extent of it is reserved to the policy on taxation. Elite Zambians and the Government have been happy to benefit from the trickle down effect of increased liquidity in the economy as a result of the FDI associated with mining, trading away the one real opportunity to promise a future for the average Zambian who remains voiceless and unheard.